Using calculus, we can show that the average distance of a point in a circle to the center is $2R/3$, where $R$ is the radius. However, I have a separate way of approaching this question through intuition that gives me a different answer, and I'd like to know why my intuition fails. For each $\theta\in [0,2\pi)$, we can consider the line segment of that angle from the center of the circle to the boundary. On this line segment, the average distance from the center should be $R/2$. Then the average distance from the center over all points in the circle should just be $R/2$ as well, since we can cover the circle with these line segments. Why does this intuitive approach give the wrong answer? My best guess is that these line segments all share the origin, so this method counts the origin's distance from itself multiple times, thereby throwing off the average by decreasing it, which agrees with the fact that we know the actual answer is greater. However, couldn't I just look at the average distance from the center for the open line segments that exclude the center? The average distance for these open line segments should still be $R/2$, and then I could apply the same argument for covering the circle with the open line segments. This time, I'd be missing the center, but missing a single point shouldn't throw off the answer. Why does this argument not work? Try actually drawing a circle and then drawing about twenty or thirty of your radial segments with their outer endpoints evenly spaced around the circumference of the circle. But don't draw so many segments that there is no space between the segments. Does your diagram look darker near the center of the circle than near the circumference? It should look that way if you drew dark-colored lines on a light-colored surface. This darker appearance reflects the notion that your distribution of "random" points is denser near the center of the circle. If you draw two congruent circles within the larger circle, each much smaller than the larger circle, putting one of the small circles near the larger circle's circumference and one near the center, more of your radial lines will pass through the circle near the center than through the circle near the circumference. As a result, your probability distribution is more likely to produce a point inside the small circle near the center than inside the small circle near the circumference. When people speak of a uniform distribution over the area of a circle, they generally mean that any two congruent regions within the circle are equally likely to be "hit." That is, in a uniform distribution over the area of a circle, you would be equally likely to choose a point in either of the smaller circles in the previous paragraph. You are looking at two different probability spaces. In the first case, you pick a point at random in the disk, sort of like throwing a dart at a dartboard, if we assume that the probability of landing in any small region is proportional to the area of the region. In the second we first pick a radius, say by spinning the disk and choosing the vertical radius in the upper half-disk, as in wheel of fortune, and then we pick a point uniformly at random on that radius. It's somewhat surprising that we get different answers, I agree, but there's no a priori reason why we should get the same answer, is there? The short answer is that you can't cut a 2-dimensional object into 1-dimensional objects that have zero width. 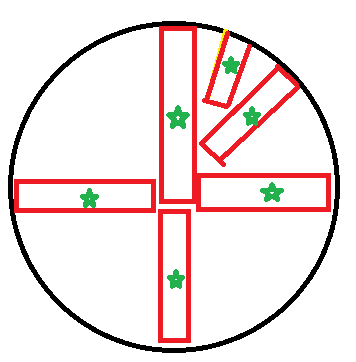 You could try cutting your circle into thick line segments, but that wouldn't work because they would all crowd together near the center (and overlap, so you would be double counting). Imagine you have a fat marker. You can easily draw a line from the center to the edge). But now, the second line that you will try to draw from the center has to start a little farther away from the true center, otherwise you'll overlap. And after you've drawn about 4 lines (in the shape of a cross), the 5th line is going to be even harder to draw close to the center. My sketch shows the fat marker lines, and the green stars are the centers of the fat lines, and you can see they are not all the same distance. If you want to cut your circle into smaller objects, then you could consider cutting it into triangles, and then calculating the average distance from the apex of the triangle. The more triangles you have, the less error you have near the circumference where the triangle's straight edge underestimates the curved edge. If you draw radii with uniform direction, then draw points uniformly along them, you don't obtain a uniform distribution in the disk, and this biases the estimate in favor of shorter radii. Not the answer you're looking for? Browse other questions tagged calculus probability geometry intuition or ask your own question. Why the expectation of distance to center of disk is $r/3$ and not $r/2$? Average distance to perimeter of a polygon? Find the distance between the center of an unit circle and an internally tangent circle, which's tangents meet at the outer's center in a 72° angle. Prove the center of the unit circle has the highest average ray length? How is the eccentricity of a circle equal to zero?